Celia Brayfield and Ian Dunt discussing ‘Brexit: What the Hell Happens Next?’. Photo © Mick Yates. 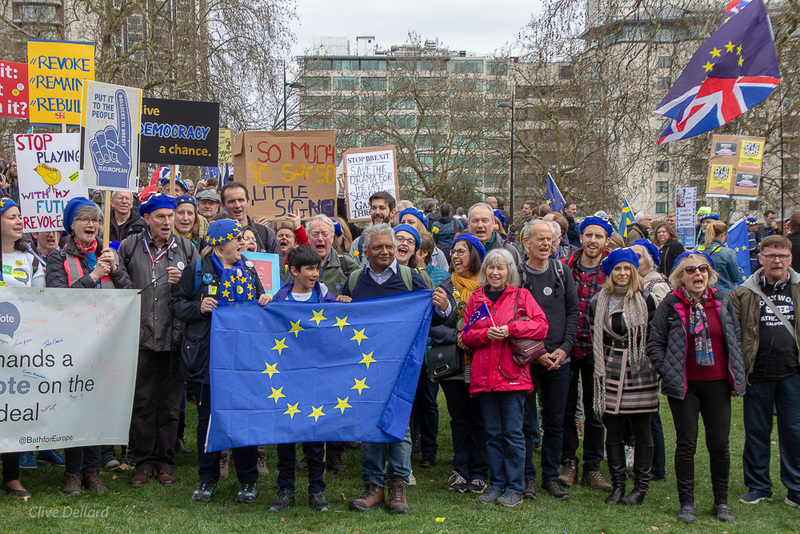 ‘Brexit: What the Hell Happens Now?’ is the question asked by both Remainers and Leavers as frustration with the current situation grows. It’s also the title of the book by top political journalist Ian Dunt, a regular contributor to the BBC, Sky News and national press, who was in Bath on 15th November to discuss that very issue at St Michael’s Church. The sold-out event attracted an audience of 200. 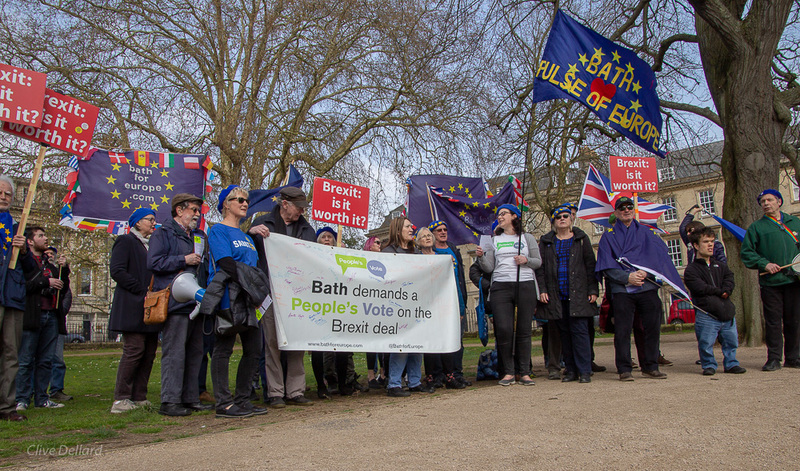 A group of some 20 picketers, a few who had traveled from as far away as Taunton, stood outside the venue brandishing ‘Vote Leave’ placards. Leave protester outside Ian Dunt’s talk. As @IanDunt posted on Twitter afterwards, “Ironically, my book is basically just a long answer to this question.” Photo © Mick Yates. In conversation with fellow journalist, author and university lecturer Celia Brayfield, Ian said he wrote the book, which he has just updated in a second edition, to show that what experts say matters. He is a self-confessed Brexit nerd, so it is no surprise that his book is based on meticulous listed research and conversations with 24 experts in various fields and political persuasions. Interviewing Ian, Celia pointed out that the introduction to his book portrays a bleak, dystopian picture of what Britain would look like should the worst-case scenario of the many possible permutations of Brexit come to pass. She called Ian’s book the ‘weapon of choice’ when talking about Brexit. It provides a lucid overview of what is a tremendously complex subject. Ian Dunt and Celia Brayfield spoke to a packed and enthusiastic house at St Michael’s, Bath. Photo © Mick Yates. In a wide-ranging conversation, Ian engaged and informed the avid audience in the packed church on topics from the economy to Euratom to flights to the US. His main concern was that the government seems unable to understand the repercussions of a ‘no deal’ scenario. He believes that Remain needs a multi-pronged communication strategy. Ian remains optimistic that public opinion can be shifted with calm and reasonable debate. There were plenty of questions at the end, a key one being about the Irish border. This, in Ian’s view, could be a game changer as Ireland has considerable power and could halt the Brexit process. 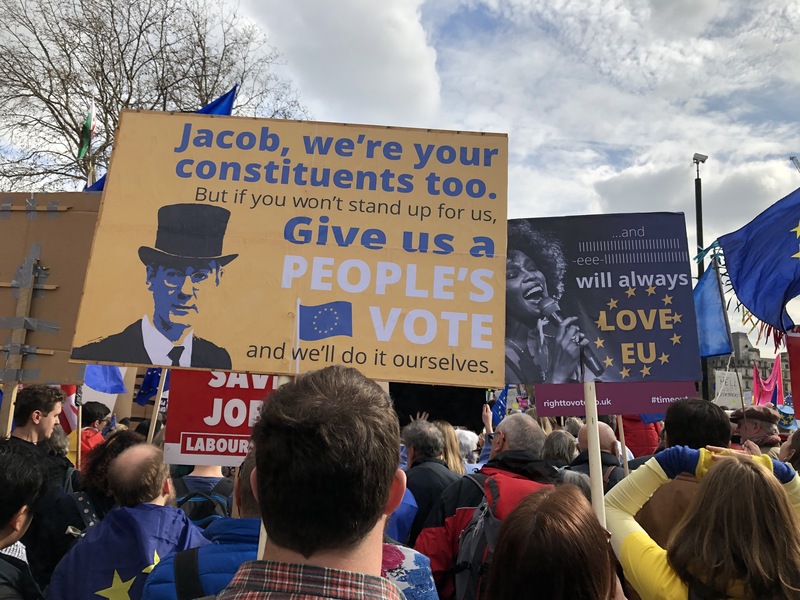 He also commented on the fact that divisions in the Tory Party are ‘now being very public’ with Dominic Grieve’s latest speech in parliament, rejecting the amendment to fix the date for leaving the EU, as a ‘litmus test.’ Ian and Celia received a standing ovation at the end. Ian signed copies of his book which were sold by Mr. B’s Emporium of Reading Delights. Huge thanks to everyone who helped make this outstanding evening possible. Ian Dunt’s book is an excellent overview of Brexit. Photo © Mick Yates. Bath Berets in the audience. Photo © Mick Yates. Members of the audience were eager to pose their questions to Ian Dunt. Photo © Mick Yates. Watch the fascinating conversation between Celia Brayfield and Ian Dunt on YouTube. Photo © Mick Yates.